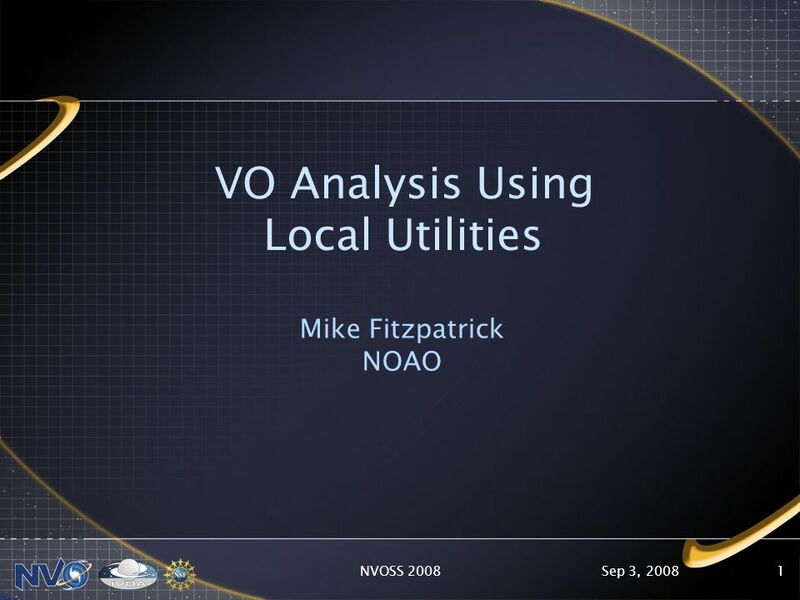 Sep 3, 2008NVOSS 20081 VO Analysis Using Local Utilities Mike Fitzpatrick NOAO. 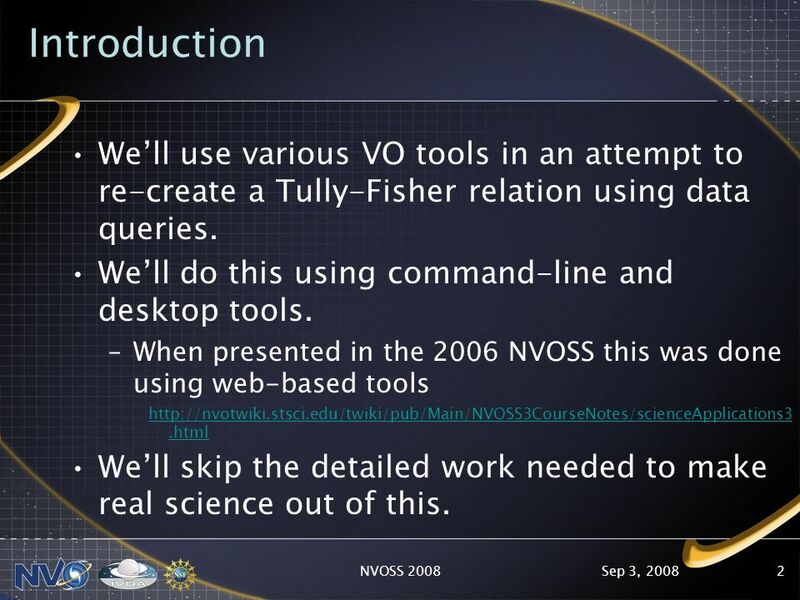 2 Sep 3, 2008NVOSS 20082 Introduction Well use various VO tools in an attempt to re-create a Tully-Fisher relation using data queries. Well do this using command-line and desktop tools. 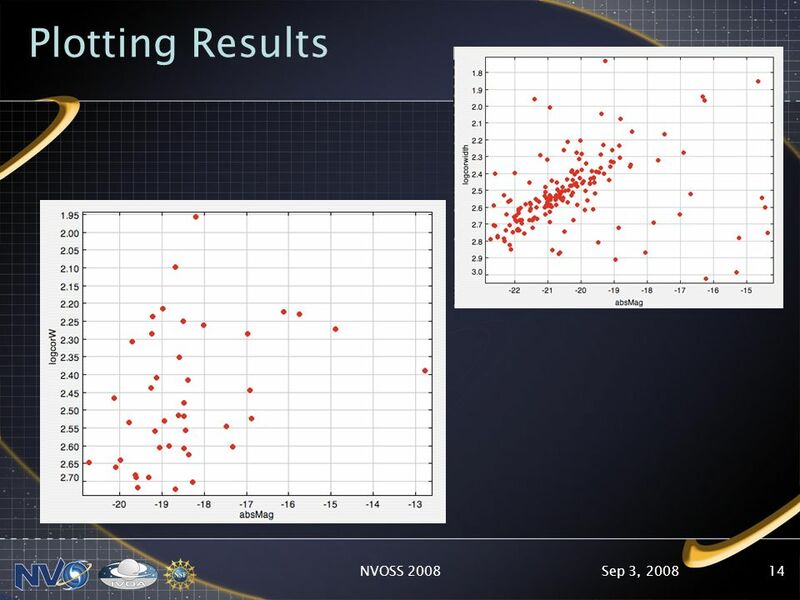 –When presented in the 2006 NVOSS this was done using web-based tools http://nvotwiki.stsci.edu/twiki/pub/Main/NVOSS3CourseNotes/scienceApplications3.html Well skip the detailed work needed to make real science out of this. 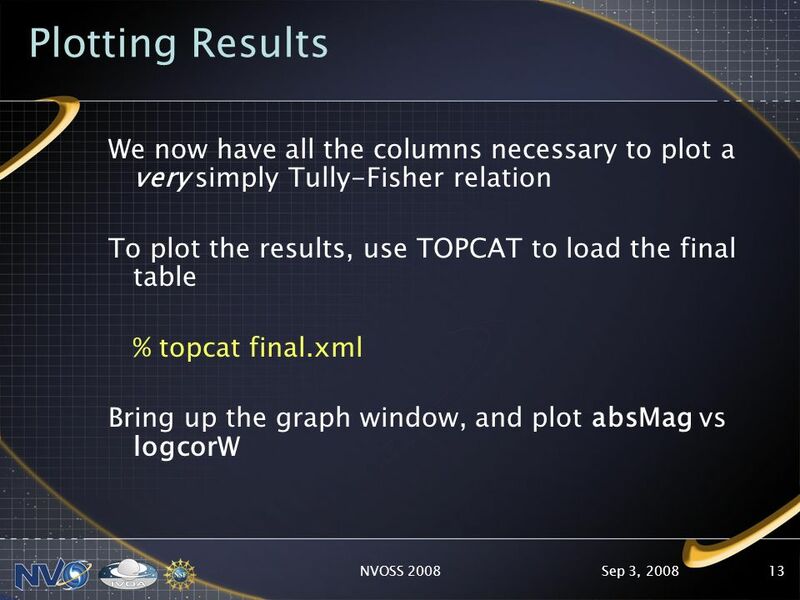 3 Sep 3, 2008NVOSS 20083 Whats a Tully-Fisher Relation? 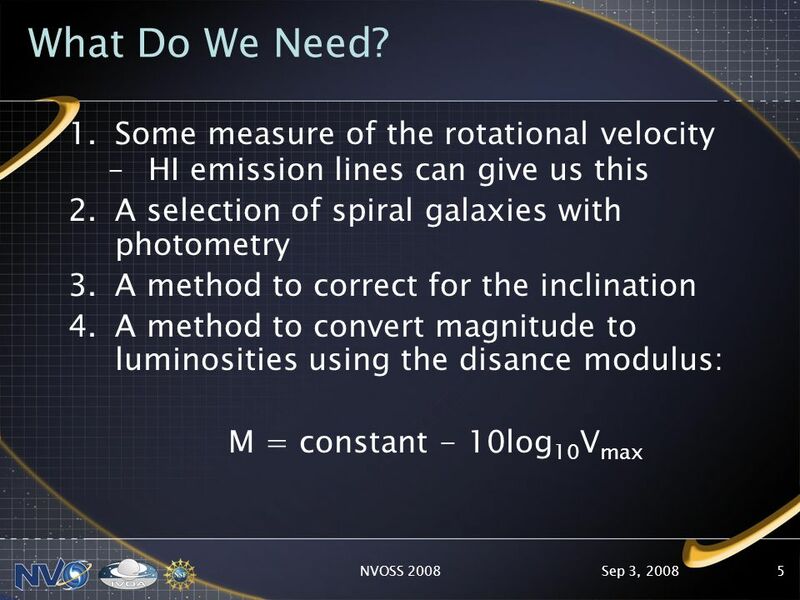 A (empirical) correlation of the luminosity and maximum rotation velocity of a spiral galaxy. The bigger a galaxy is, the faster it rotates. 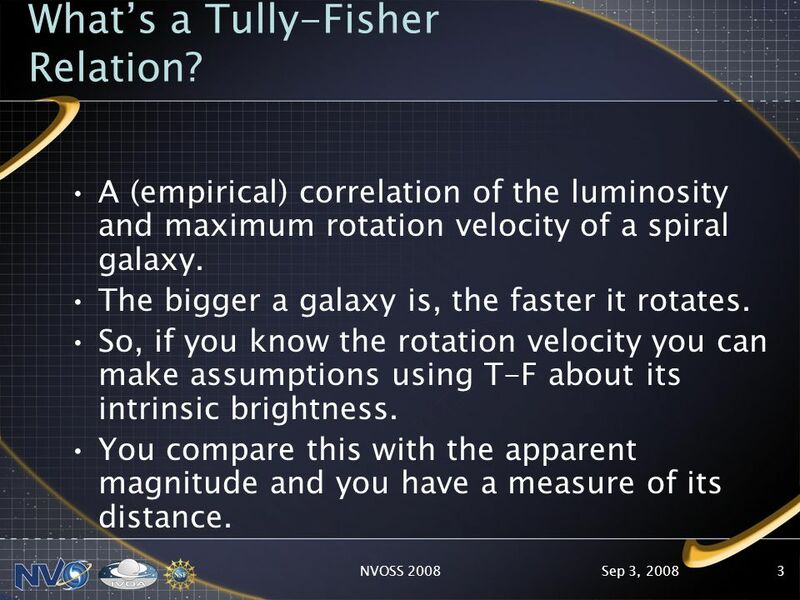 So, if you know the rotation velocity you can make assumptions using T-F about its intrinsic brightness. You compare this with the apparent magnitude and you have a measure of its distance. 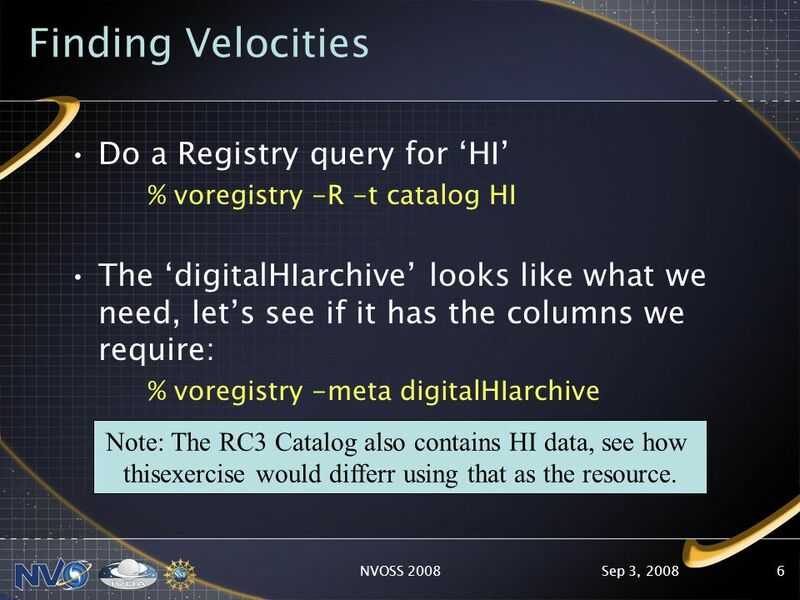 6 Sep 3, 2008NVOSS 20086 Finding Velocities Do a Registry query for HI % voregistry -R -t catalog HI The digitalHIarchive looks like what we need, lets see if it has the columns we require: % voregistry -meta digitalHIarchive Note: The RC3 Catalog also contains HI data, see how thisexercise would differr using that as the resource. 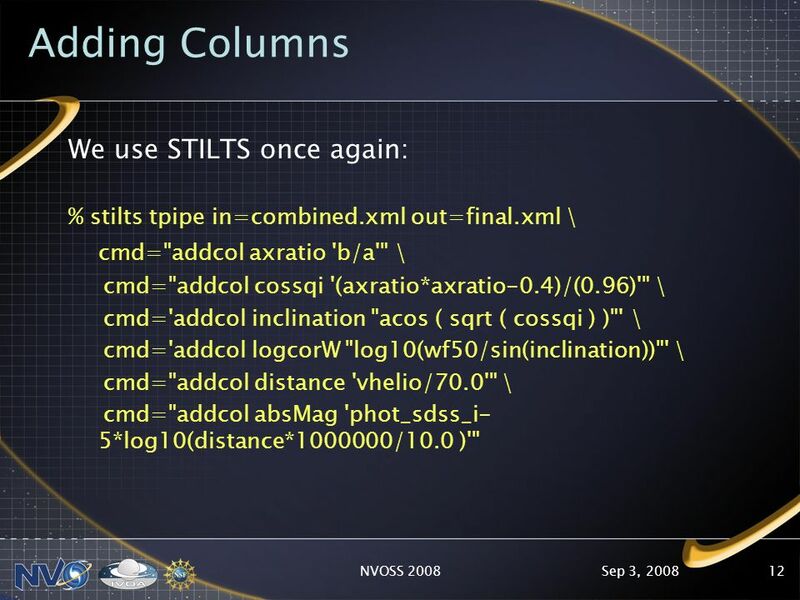 12 Sep 3, 2008NVOSS 200812 Adding Columns We use STILTS once again: % stilts tpipe in=combined.xml out=final.xml \ cmd="addcol axratio 'b/a'" \ cmd="addcol cossqi '(axratio*axratio-0.4)/(0.96)'" \ cmd='addcol inclination "acos ( sqrt ( cossqi ) )"' \ cmd='addcol logcorW "log10(wf50/sin(inclination))"' \ cmd="addcol distance 'vhelio/70.0'" \ cmd="addcol absMag 'phot_sdss_i- 5*log10(distance*1000000/10.0 )'"
Download ppt "Sep 3, 2008NVOSS 20081 VO Analysis Using Local Utilities Mike Fitzpatrick NOAO." 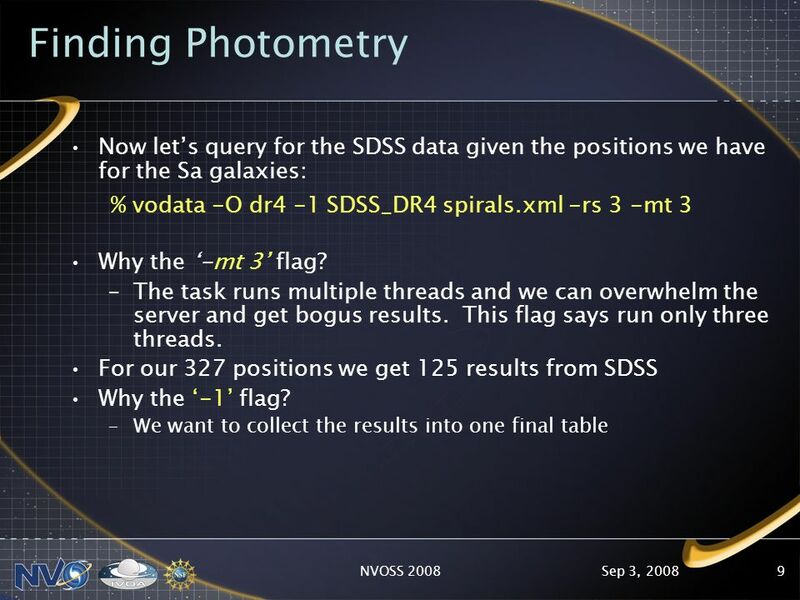 VO/IVOA and The Astronomy Community Dave De Young NOAO. 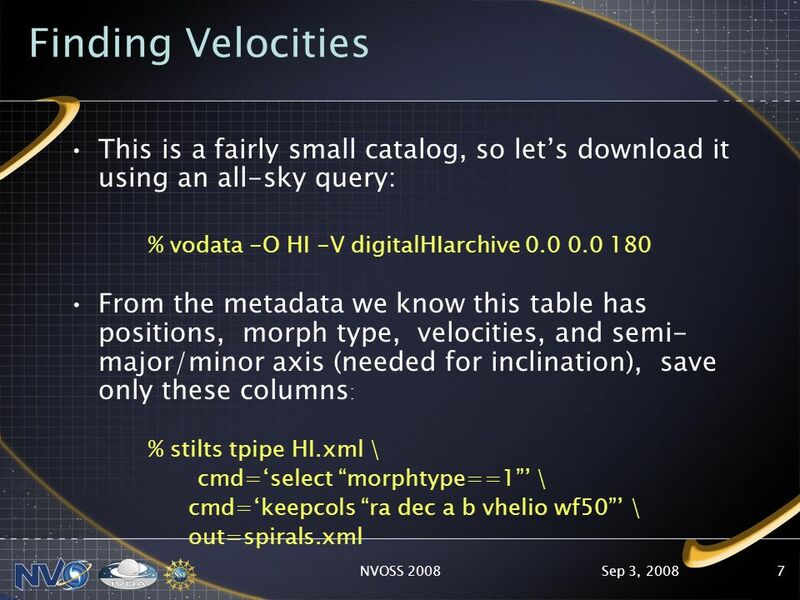 1 Virtual Observatory Of India VOPlatform & Mosaic Service from VOIndia Tushar Agrawal VOIndia, IUCAA. 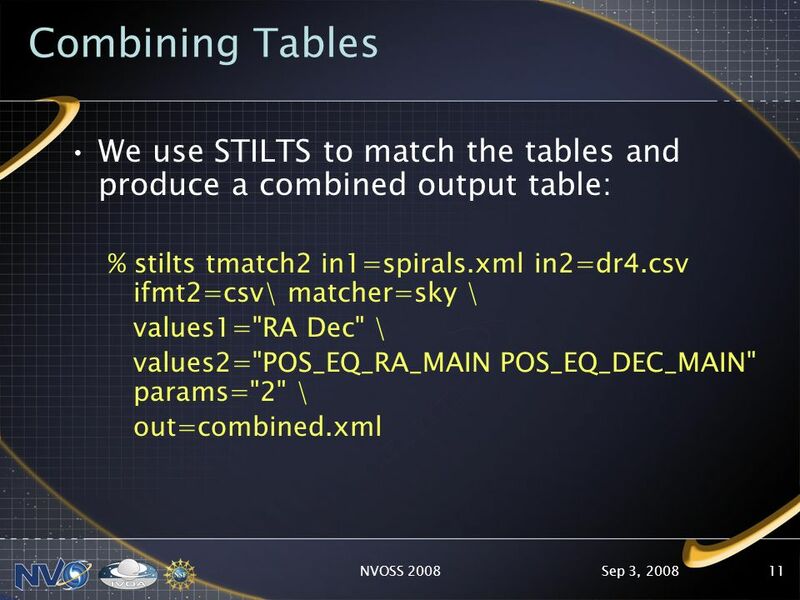 STILTS – Command-line tools for table/VOTable manipulation TOPCAT VO features – VO features in the GUI tabular data exploration tool SPLAT-VO – SSAP functionality. 29 May GNSO Improvements Top Level Plan 29 May 2009 Plan distributed 22 May by Avri. 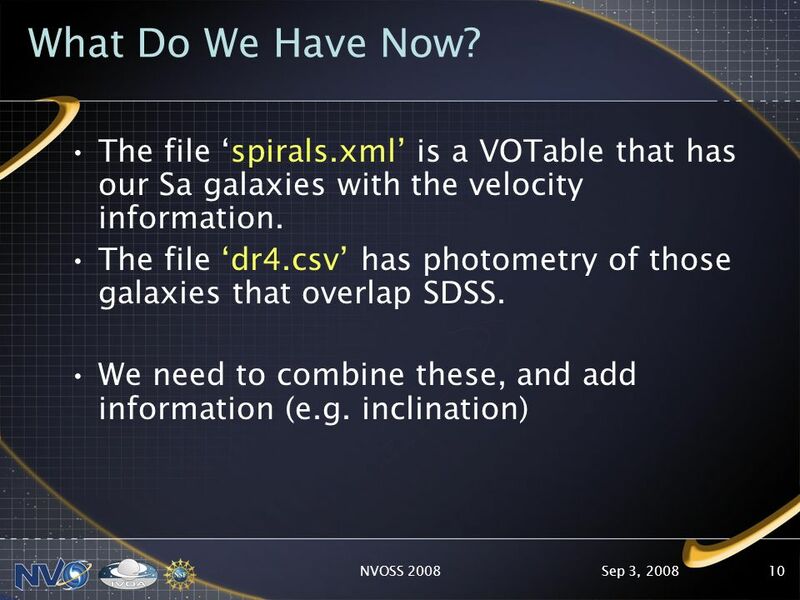 NVO Summer School VO Protocols and Jargon Overview Tom McGlynn NASA/GSFC T HE US N ATIONAL V IRTUAL O BSERVATORY. 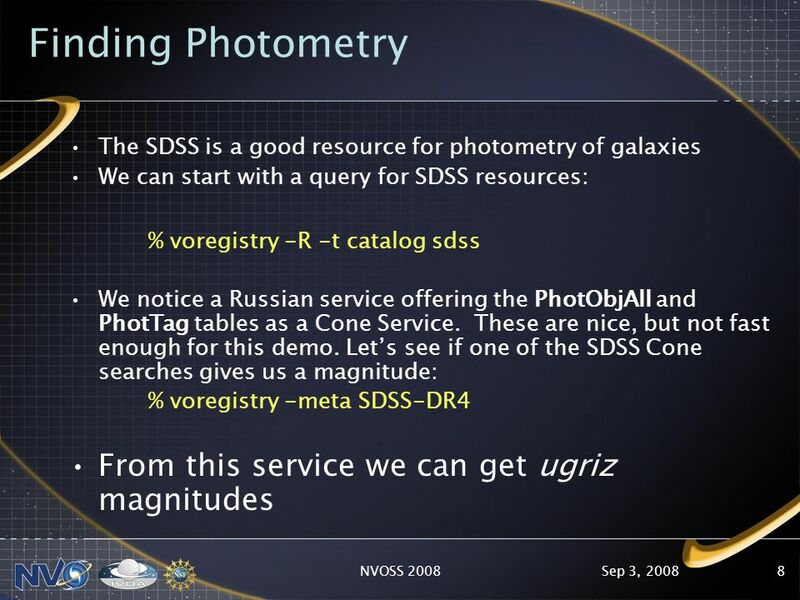 6 September 2008NVO Summer School 2008 – Santa Fe1 DAL Clients: Scripting Data Access with Python Ray Plante T HE US N ATIONAL V IRTUAL O BSERVATORY.